I draw your attention to a letter published in the West Sussex County Times of the 2nd February, 2012, which makes reference to the proposed increase in parking charges in Horsham, specifically at the Hurst Road car park, which lies adjacent to Horsham’s leisure centre. WITH regard to councillor Roger Paterson’s response to our petition and concern over the ever changing Hurst Road, Horsham, car parking fee hike (County Times Horsham edition January 19), I took exception to the fact he thinks a 50 per cent increase is ‘small’. I also wonder how anyone simply parking their car to go to the gym or the park at Hurst Road could agree with Mr Paterson that paying an increase five times more than inflation will give a ‘huge improvement to the experience of car parking’. Common sense being shown by the council in relation to the fee increase at this particular location seems to be playing second fiddle to the money grab from those trying to maintain a healthy lifestyle by going to the gym or the park. It used to cost £1 to park for three hours at the Hurst Road car park. The Council has increased this to £1.50 for three hours, from yesterday, the 5th March. This increase, according to Dr Michaelis, stands in conflict with one of Horsham District Council’s ‘key goals’ – fostering healthier lifestyles – on the grounds that a good number of people will cease to visit the leisure centre now that three hours’ worth of parking there has gone up by 50 pence. What they might be doing instead – presumably going somewhere else in their cars, or sitting at home – is a matter of guesswork. To set this in context, the leisure centre and car park in question lie pretty much at the centre of Horsham. On the map below, I have illustrated the longest possible journey you would have to make, from within Horsham, to the leisure centre. It is just over 2 miles, and would take you 40 minutes, on foot – or much less if you jog (but of course that’s the last thing people going to a leisure centre to keep fit would do). Bear in mind that this is the longest journey, from within Horsham. Most other trips would be of the order of a mile. This is an eminently walkable distance, especially for those people who are allegedly interested in ‘trying to maintain a healthy lifestyle’, as Dr. Michaelis puts it. Some of the roads you might have to cycle on are not brilliant for the more nervous, but you can now cycle across the large park that lies to the west of the leisure centre, and there is also plenty of cycle parking at it. These are things that Horsham District Council has most definitely got right. A bicycle could certainly make your trip much easier, even if you are not confident enough to use it all the way. So there are ways of circumventing the increase in the cost of parking entirely – ways that would actually serve to increase public health in Horsham District, in addition to the benefits accruing from the use of the leisure centre itself. Dr Michaelis, however, apparently cannot envisage people getting to the leisure centre by any means other than the private motor vehicle. She also appears to believe that people who are interested in keeping fit will just give up ‘trying to maintain a healthy lifestyle’ as a result of a 50 pence increase in parking for three hours, and also that these allegedly health-conscious people would not consider walking, running or cycling to the leisure centre instead. To foster healthy lifestyles, it seems we should continue to encourage and facilitate car use. This entry was posted in Car dependence, Horsham, Horsham District Council, Parking. Bookmark the permalink. Go to any leisure centre car park and you’ll still see people trying to park as close to the entrance as possible. Do you know how long Hurst Road car park has been £1? I wouldn’t be surprised to find that it’s had a below-inflation (or zero) price rise for a while. If Dr SUSAN MICHAELIS is getting this wound up about a 50p price increase (sounds so less grand then the 50% figure doesn’t it?) then I’d hate to think about what else they get incredibly angry about and the effect this has on the Dr’s blood pressure…..
3 hours for £1.50, that’s pretty much giving it away! That wouldn’t even get you 15 minutes in a central London car park. I know it’s hardly a fair comparison, I once misread a car parks charges and paid £26 for about 45 minutes as they did it in 2 hour blocks at one near Trafalgar Sq. Thankfully it was a business expense so I could claim it back!! The irony of people driving to the Pavilions and paying to park in the Hurst Road car park to take part in spinning classes is never ever lost on me when I go in there. I used to do just that until it dawned on me whilst waiting for the bikes to be available that I could just cycle to the gym in the first place….. Parking charges are such an emotive issue that people regularly forget simple logic when discussing them. Recently people have been moaning about how expensive it is to park in Worthing, and people say they now drive to Chichester to park more cheaply. The fact that driving to and from Chichester from Worthing costs somewhere between £5 (fuel only) and £15 (all motoring costs at the AA’s suggested 37p/mile), and takes over an hour, is completely ignored! Greg C, you said:” The irony of people driving … to take part in spinning classes is never ever lost on me..” I have to confess to sometimes cycling to the gym and then going on an exercise bike. My best defence is that you can’t go fast in London, and that’s not all I do in the gym, but I was rightly mocked. My favourite is the “do not fix bike here’ sign so commonly seen on railings outside gyms/leisure centres. 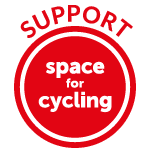 We can’t have people cycling to do sport or exercise – where would it end?